On Monday, U.N. weapons inspectors arrived in Iraq after a four-year hiatus. Backed by a strong mandate and the threat of military force, the inspectors' mission is to ferret out clandestine nuclear, chemical, and biological weapons. One of the most vital, and yet also difficult places to search will be underground. Aerial photographs, intelligence, and past experience all suggest that Iraq has stashed weapons underground: in the desert, in cities, and under expansive palace complexes.During the last round of inspections, geophysicists found millions of dollars worth of weapons-related materials buried up to 20 meters below ground in the deserts surrounding Baghdad. Like their predecessors, the current inspectors will be armed with advanced geophysical tools to peer into the subsurface. These are the same tools that geophysicists use to locate underground polluting sources, mineral lodes, electrical cables, groundwater, and a host of other items. 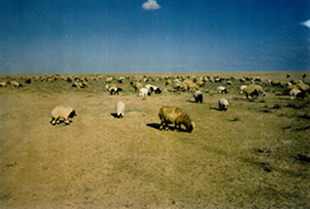 Geophysicists on assignment with the International Atomic Energy Agency used electromagnetic sensors to scan a three acre desert area northwest of Baghdad for belowground weapons in 1997 (left). The sensors detected buried metal scattered throughout the area. Subsequent excavation revealed nuclear-related equipment stacked on wooden pallets and carefully wrapped in plastic sheets -- equipment worth $5-10 million (right). Image provided by Geophex. "This is basically a crime investigation," says John Pike, director of GlobalSecurity.org, a private military research organization. "And as with any police inquiry, the more investigative tools, the more evidence you can collect, the more coherent a theory on the case you can gather." Any geophysical tools that will work in Iraq have to be fast and produce real-time data, explains I.J. Won, president of Geophex, the only private geophysical company to search for subsurface weapons in Iraq during the 1990s as part of the U.N. inspections. Hostile environments place a premium on being able to get in to a site, conduct a survey, and do any necessary excavations within a day or two. "At a lot of the places [around Baghdad] you can not guarantee the integrity of the site overnight. People steal your equipment. If you leave your equipment on the ground, a lot of time you see the equipment on the street market the next day," Won says. "The goal is to get the survey done quickly and with minimum logistics." Three geophysical tools fit the bill, according to Won: electromagnetic, magnetic, and microgravitational. Electromagnetic sensors emit electromagnetic waves at multiple frequencies into the ground, and then measure the amount and frequencies of waves reflected back to the sensor. Metals or other manmade objects below the surface show up as significant changes in the signature of the reflected waves. While this technology has been around for a while, it can be incorporated into hand-held sensors that provide real-time data and 30 data points per second. That speed and portability translates into a single surveyor being able to comprehensively scan three acres in an afternoon. Electromagnetic sensors typically operate below 100 kilohertz, which allow deep penetration down to tens and hundreds of meters. This sharply contrasts with ground-penetrating radar (GPR) that operates at much higher frequencies and cannot penetrate the salty conductive soils present in most of Iraq. In contrast to the electromagnetic sensors, magnetic sensors are passive. Rather then actively interrogating subsurface targets by emitting pulses and recording echoes, magnetometers measure how objects below ground distort Earth's magnetic field. For instance, a buried steel canister will deflect a compass needle; magnetometers measure these slight changes in the Earth's magnetic field. Microgravity meters -- also called gravimeters -- measure minute differences in gravitational pull at one site versus another. Large underground voids, such as tunnels or weapons production facilities, slightly lower Earth's gravitational pull at the surface right above the voids. Gravimeters can detect these differences, indicating where such facilities might exist. According to a source familiar with the inspections, gravimeters operate too slowly to efficiently scan large areas. However, they work well within a single structure, such as a palace or a bunker, where single and/or multiple basements are suspected. 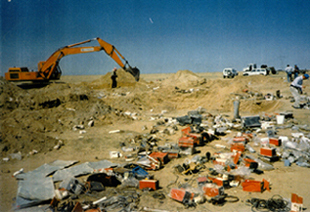 A combination of magnetometers, electromagnetic sensors, and gravimeters allowed Geophex technicians to successfully find buried weapons on land in Iraq during the 1990s inspections. The magnetometers worked well in detecting equipment made of iron since iron strongly interferes with magnetic fields. However, those sensors could not locate equipment made of other materials. This limitation became paramount when inspectors were looking for buried copper coils that could be used to separate radiogenic isotopes as a preliminary step in building nuclear weapons. Electromagnetic sensors ended up revealing coils that were invisible to the magnetometers. During their surveys, technicians worked on the ground, walking over suspect areas with sensors in hand. In the early 1990s, the United Nations tried to probe the subsurface from the air, with geotechnical tools attached to helicopters. Those efforts were largely unsuccessful, perhaps in part due to difficulties in directing excavation on the ground to the exact location where the geophysical tools indicated there were buried weapons, according to a source familiar with the inspections. Current inspectors may again attempt to search from the air; if this proves successful, it will greatly expand the area that can be covered in the surveys. The basic sensor technologies have not evolved much in the four years since inspectors were last in Iraq, Won says. While advances in aerial photography and hand-held pathogen detectors have significantly enhanced the inspectors' capabilities on other fronts, no similar developments have taken place on the geophysical side of the equation. The "dot com" boom spurred developments in ways to display spatially distributed data, but not in the sensors themselves. "Everyone was busy making pretty maps." The one major advance, Won says, is that GPS devices have become much smaller and can be integrated into the sensors -- allowing people doing excavations to return precisely to where geophysicists found indications of buried weapons, without requiring markers on the surface that could be stolen or moved. In addition to ground-penetrating radar, several other geotechnical techniques that successfully probe the subsurface in other conditions are not as useful in Iraq. Seismic surveys that may be able to find large cavities take a long time to acquire and analyze data, rendering them less effective. Likewise, electrical resistivity tomography -- which maps the electrical conductivity of the subsurface to discern belowground features -- is relatively slow. In addition, the resistivity method requires planting electrodes throughout the soil, a disturbance inspectors would like to minimize given the possibility of chemical or biological contaminants in the soil. Even with advanced geotechnical equipment, a comprehensive search of belowground weapons is beyond the scope of the inspectors' capabilities, especially given the expedited timetable dictated by the U.N. resolution authorizing the inspections. "I think it would be wrong to assume that recent technology advances will enable inspectors to unerringly ferret out Iraq's hidden weapon program. Iraq's weapons program is probably small, and Iraq is a big country," Pike says. The underground hunts will likely be more focused, Pike explains. On Dec. 8, under the new U.N. resolution that Iraq agreed to, Iraq must submit a detailed list of its entire cache of chemical, biological, and nuclear weapons. The inspectors will go to sites on that list, and other sites suggested by intelligence and aerial photographs to harbor weapons, and attempt to quantify the amounts of weapons at these places. If the inspectors show that the weapons that exist, including those belowground, do not match with what Iraq had declared, such a "breach" could trigger a meeting of the U.N. Security Council, at which the U.S. could call for a military attack against Iraq.